Sir George Taubman Goldies' tomb, originally uploaded by Jeremy Weate. His wife Maud is also buried there. 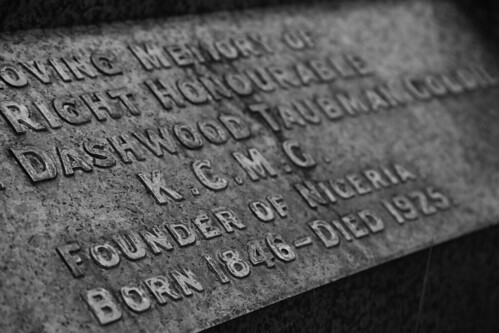 As I took the picture, I wondered whether Flora Shaw (later to marry Lord Lugard) really was his mistress. Brompton Cemetery for the rest of chiefs and even much mischief too. Flora did it for Britannia! (At least that's the story she should stick to/ To which she should stick). Wikipedia says he is buried in Guru, Lapai LGA in Niger state. Brompton has just a memorial stone?